1) Who “is” Alex Burns? Alex Burns is an interesting dude. 2) What did you do before you were “in laundry”? Before laundry I attended Northeastern for business and played sports whenever I could. I pretty much spent everyday either doing school work or watching / playing sports. Laundry was NEVER on my mind haha. 3) Why did you create the company, the idea, “Life Without Laundry”? I started the business because I thought I could help people and carve a niche in the market with a little humor added to a great service. I have enjoyed every second of the experience. Starting with our first order ever all the way up to our first dry cleaning order back in June. And now we proudly serve over 1800 customers in the Greater Boston area. 4) Either you really hate, or really love Laundry—how does it feel to be balls deep in it day in, day out? I can’t get enough of it and love doing it. Oh wait no I don’t. In fact Alex Burns is someone who has had his grandmother do his laundry since high school. I just couldn’t stand folding. So ya and now I own a laundry company that processed 500+ lbs of laundry and couple hundred lbs of dry cleaning a night so ya……. Haha no but in all seriousness I started the business because I thought I could help people and carve a niche in the market with a little humor added to a great service. I have enjoyed every second of the experience. 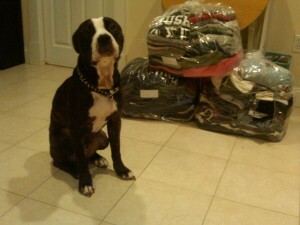 Starting with our first order ever all the way up to our first dry cleaning order back in June. And now we proudly serve over 1800 customers. Oh and “ball’s deep” was like 3 months ago. It’s way above my balls now.